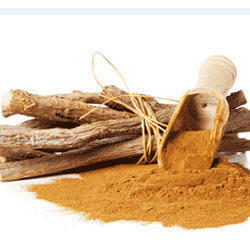 Pioneers in the industry, we offer glycyrrhiza glabra root extract and valerian officinalis root extract from India. Valerian (Valeriana officinalis, Valerianaceae) is a hardy perennial flowering plant, with heads of sweetly scented pink or white flowers which bloom in the summer months. Valerian flower extracts were used as a perfume in the sixteenth century. Valerian is used for insomnia and other disorders as an alternative to drugs, and as a seative for nervous tension, hysteria, excitability, stress and intestinal colic or cramps. Valerian is used for sleeping disorders, restlessness and anxiety, and as a muscle relaxant. Certain data suggests that Valerian has an effect that is calming but doesn't cause sleepiness the following day. When used as a sleeping aid, valerian appears to be most effective on users who have difficulty falling asleep.